I Know, I Know, Two In A Row? I loved the picture and reading about your precious baby!!! What a neat experience to have! And I'd say that little one is one lucky little lamb, also. She's so beautiful! I want a little sheep of my own! 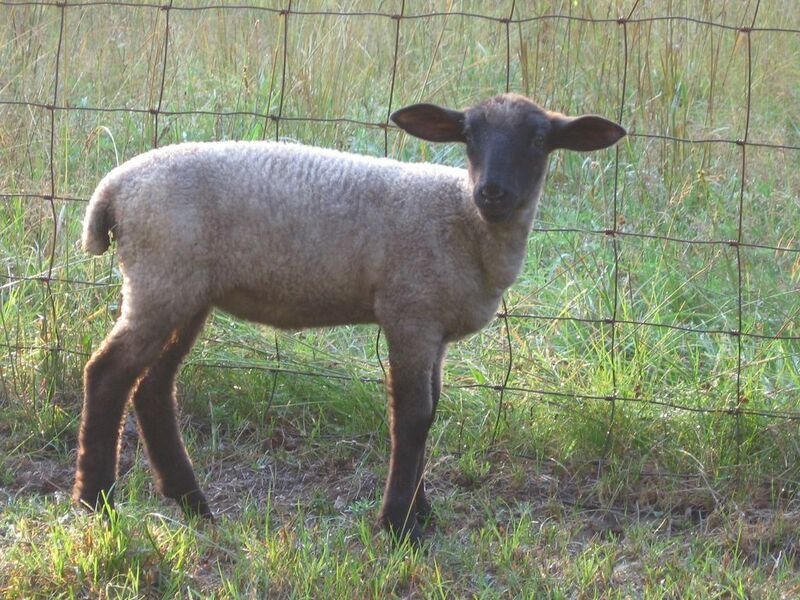 She's already starting to look like a "grown up" sheep. I've been meaning to ask: Can you house-train a lamb? Or do you just follow her around with paper towels? Is there a beauty pageant for sheep? Cary is beautiful and so well behaved. When you call her name, does she come to you? It looks like her leg is pretty much back to normal. Is she going to be able to do all the usual sheeply things when she's an adult? And when are sheep adults? She's grown into quite a beauty from being quite a cutie! I was also wondering if a lamb can be house-trained. How cool to have a little lamb. Cute photos! A regular little beauty, she is! Just e-adopt Cary--all the cute and none of the, um, poop! Okay, now that several people (including my mother) have asked me about the whole lamb housebreaking/potty training thing, I guess I need to give you all some (hopefully tactful) answers. So here goes. Anyway, it's not as bad as some people are probably now imagining. And, no, I haven't put diapers on Cary, though I know of somebody who did put them on one of their bottle lambs. First of all, we spend a lot of time outside. Secondly, a vegetarian baby is a lot different than a meat eating baby--let's just say there's a lot less odor involved. Third--I can often anticipate when she has to "go," for example after waking up from a nap, so we head outside. Fourth--Bean, sometimes I feel like that's just what I do: "follow her around with paper towels." : ) I have been extremely frugal with my use of paper towels for as long as I can remember (I try to make as little garbage as possible.) I am now using up my lifetime allotment of paper towels. When are sheep adults? I would have to go look in a book for an official answer, but I think most sheep are fully grown at about two years of age. A female sheep can become pregnant at well under a year, and a ram can impregnate her at 6 months of age. We'll be picking up our new ram in a month of two for breeding this year, and he was just born at the end of March, 2006. We usually don't breed our ewe lambs until the second year, but we don't separate them out, either, so some of them do have babies when they are just a year old themselves (this is what most people do rather than "waste" a whole year). We have found that it is better for the ewes overall to wait until they are more physically mature, though. Glad you like the photos. See above for housetraining mini essay. Yep, having Cary is very cool, indeed! My goodness she is really growing up. She looks like quite the young lady! Now how are her table manners? Does she do dishes. I know she does lawns and vegetable gardens but can she do other useful things? Cuteness is great but what kind of a wife will she make someday? LOL! Gee I'm still on vacation and I can't hear my Cary photo posting alarm go off. It looks like she is enter her "teenage" period. She's growing into her ears! I think she is simply brilliant. Im so glad you went the extra mile with her. What type of lamb is she? Do you raise sheep for fiber or meat? The beautiful Cary is a wonderful treat I look forward to every day. New ram? Since you are answering tricky questions (and yes, ma'am, quite tactfaully at that) then what becomes of the quite dashing and handsome Leopold? Does he get to stick around until the new rams ewes are old enough to interest him? I bet he does. Either that or, having read all of your blog, he'll live out his life in just about the best circumstances any sheep could ever hope for. Reading your responses about Cary was delightful! Thanks for sharing information. I especially enjoyed your comments about being frugal and using up your life's allotment of paper towels. That is so funny! She really is a very lucky little lamb. Aw I love all your entries about Cary.. You should start a fan club. *sigh* Oh how I wish I lived on a farm.. The mother of the family, who was a verycountry club sort of lady, liked the sheep particularly. So when the farmer there was not interested in bottle feeding a rejected twin lamb, Mrs. M. took the lamb back to town with her during the week. She used to walk her on a leash in on the streets of her fancy neighborhood-where everyone assumed she was a Bedlington (I think that is the name for that kind of dog which is very sheep-ly looking.) Mrs, M. never corrected them, she just enjoyed watching their expressions when Daisy said "baaaaa." Daisy wore diapers, because of their fancy rugs. She is beautiful!!! I want sheep now, after seeing your pictures and reading your blog!